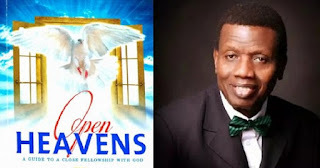 Open Heaven [22 May 2018] Exercising Your Delegated Authority - Open Heavens Daily Devotional Messages, By Pastor E.A Adeboye. It is one thing to be given authority, and it is another thing to exercise the authority delegated. Some Christians are suffering today because they do not exercise the divine authority given to them as children of God. Some children of God are like Moses in today’s Bible reading, crying helplessly at the Red Sea with the army of Pharaoh fast approaching. Beloved, do you know that God has given you the authority to tread upon serpents and scorpions and everything they represent? Jesus Christ has given to us the power and authority to tread on all the powers of the enemy, and He promised that nothing shall by any means hurt us (Luke 10:19). However, to exercise this authority, we must live according to the dictates of the One who delegated His authority to us. A lesson from today’s story about Moses is that he exercised authority by the instructions of the Almighty God. He was not presumptuous as many would have been. His cry to God could mean “what should I do in this situation?” Another lesson is that although the Lord had equipped him with the rod, he did not know the full extent of its power in solving the problems of the people he was leading. In other words, God has equipped his children with the necessary authority and power not only to defend themselves but also to rescue the perishing. You have the authority to bring change to the chaos in the world around you, but are you putting this to use?